In an effort to engage younger collectors and hockey fans, Upper Deck recently announced a promotion where one lucky fan could win the opportunity to serve as Upper Deck’s NHL Draft Runner at the 2012 NHL Draft. Participants needed to send in an essay as to why they felt they should be Upper Deck’s NHL Draft Runner. Participants could also nominate a kid they felt was deserving of this unique opportunity. And that was what happened with Salvatore Cerilli from North Huntington, PA as his mother sent in the following submission on his behalf. 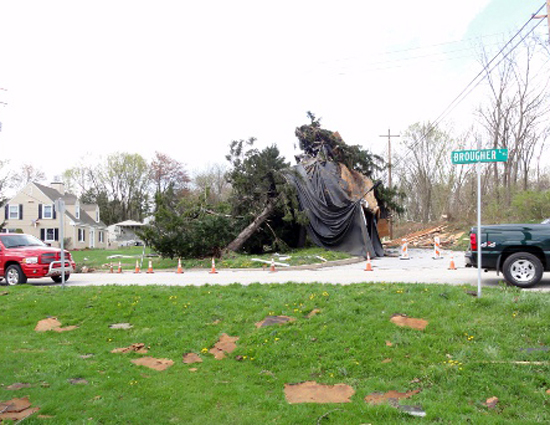 Tornadoes in the PA area did a lot of damage as you can see here. Salvatore was at home when one struck, but fortunately was not physically harmed. 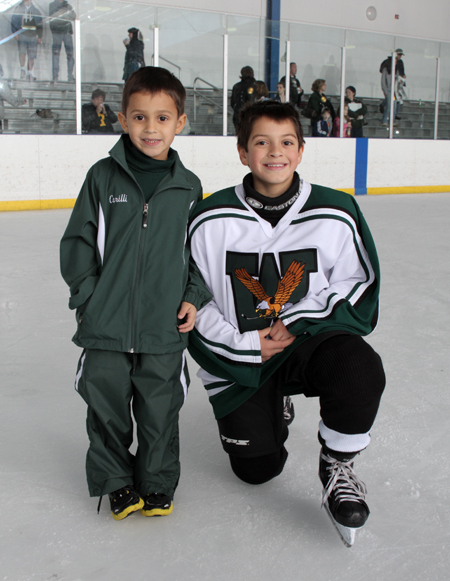 Salvatore with his younger brother Dominick on the ice after a big win! 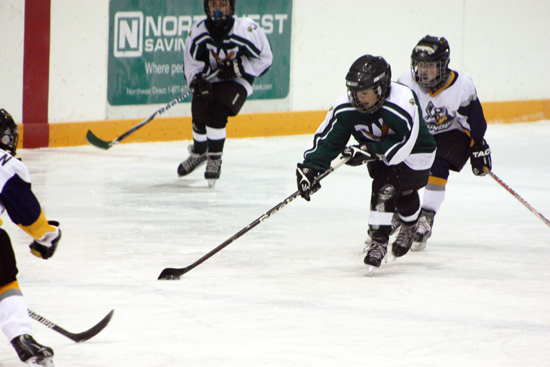 Salvatore weaving his way through defenders with the puck. 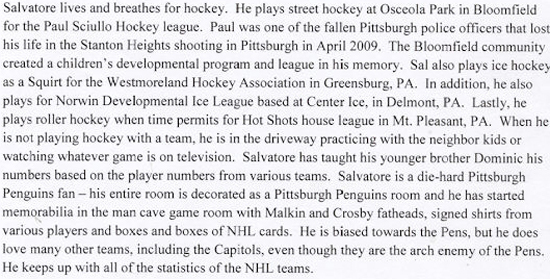 Upper Deck poured through the submissions received through the company’s participating retail partners in the area and while there were plenty of deserving kids, Salvatore’s story definitely stuck out. Upper Deck is very pleased to award Salvatore Cerilli with this very special opportunity where he will work with a NHL team on the floor throughout the 2012 NHL Draft serving as an assistant to the team. While Sal likely will not have much say in which players the team picks, he will have an amazing opportunity to go behind the curtain to see what the draft process is like for a NHL franchise. 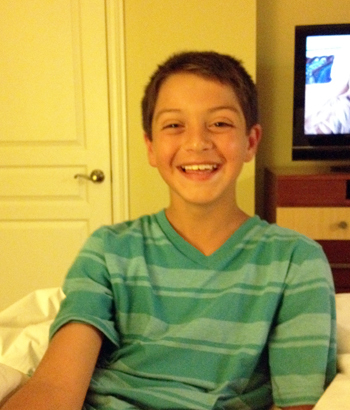 One happy kid: Salvatore after hearing the news from his parents that he would be Upper Deck's 2012 NHL Draft Runner. Thank you Sal! We know you will represent us well and we are so happy to bring a hockey fan like you closer to the game you love! Sal recently appeared on Cardboard Connection Radio to talk about his participation in the event. Take a listen by clicking HERE. And to check out a story the Tribune did on Sal, click HERE. Cant imagine a better selection! Congrats Salvatore! Truly an awesome honor. Kudos to UD for providing this opportunity. Well done guys! Way to go Upper Deck!! Great selection! And an awesome honor! Wow, that’s fantastic idea! Way to go Sal! Hooray for Sal! Go brother!!! 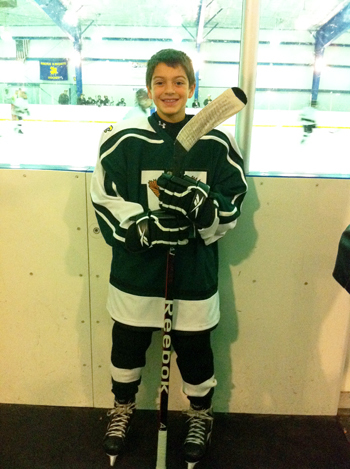 It is so nice to see a young boy with a passion and love for hockey. All your hard work is going to pay off, one day we will see “Cerilli” on the back of a Penguins shirt I know it! Keep your drive alive! Congratulations Sal !!!! Have a fantastic time!!! Will be watching on tv!!! Way to go, Sal! You’ve made a lot of people proud and you will be a great NHL Draft Runner. Enjoy the experience! Congratulations Sal. You are awesome. This is thrilling. Keep on shooting those pucks. The DiGiacomos also want to say congrats to you! We are very excited to watch the draft this weekend and can’t wait to see you!! Enjoy this once in a lifetime opportunity! We can’t think of anyone who is more deserving of this honor than you!! Way to go Sal, we know you will do a great job, congrats and GO PENS…! This is a life experience you are sure to never forget! Congratulations and have a blast! What a fabulous honor, Sal! You’ve earned it! Have a great time and enjoy yourself. I know we’ll all be watching for you. Thanks Upper Deck for making this young man’s dream come true. Great selection! Congrats Sal…. What an awesome experience. Nyla says that you are going to be famous when you are older… Keep up the hard work and all your dreams will come true. We love you..
Congrats, Sal! Have a fantastic time and bring back your experience and memories to share with all of us at Queen of Angels Catholic School! I will be at the draft, looking forward to seeing you enjoying this great opportunity. Congratulation Sal!!! Way to go!!! We are so proud of you. Can’t wait to see you on TV. 🙂 Can we get your autograph before it costs more than what I make in a year? We know you will be great! Congratulations Sal! This is a once in a lifetime opportunity – Enjoy it! Congratulations Sal! We are so proud of you. I’m sure you will have a blast. Mason and Sydney can’t wait to hear all about it. Have fun!